You guys! Exciting things are happening! 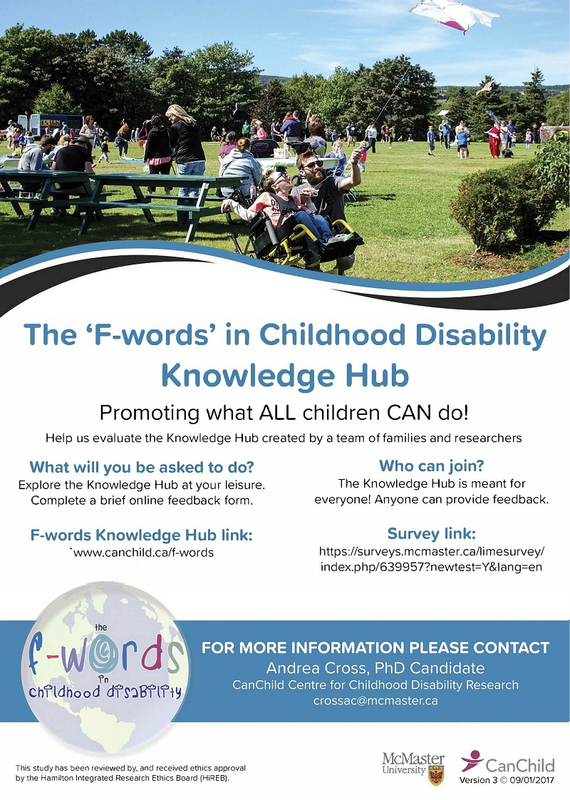 I have written several times now about my involvement with the 'F-Words' research with CanChild Centre for Childhood Disability Research. (See HERE and HERE). Our goal has been to address the knowledge needs of families with children with disabilities and to support the uptake of the F-words concepts in children's health care. The 'F-words' we're talking about are Function, Family, Fitness, Fun, Friends, and Future. There has been a very positive response to the F-words concepts, and it is exciting to see that they are being incorporated into therapy planning by both clinicians and families all over the world. We have recently created a Knowledge Hub, where people can go to learn about and share ideas for moving the F-words into practice. There are six main sections in the Knowledge Hub: 1) The F-words Homepage; 2) ICF Resources; 3) F-words Footprint; 4) Family & Clinician Voices; 5) F-words Tools; and 6) F-words Research Team. In order to ensure that the Knowledge Hub is meeting the needs of stakeholders, we are conducting a pilot evaluation. After exploring the Knowledge Hub, we hope you will share your feedback with us by completing a brief and anonymous survey. A new video was also created to bring awareness to the 'F-words'. That video has been entered into the CIHR Institute of Human Development, Child and Youth Health (IHDCYH) Video Talks Competition, and is now in the running to access funding for our research. We just need to get a few more 'likes'. I encourage you all to click here to watch the video and give it a thumbs up! On behalf of the 'F-words' in Childhood Disability Research Team, we greatly appreciate your time and support! Thank you! !